When the microwaved beeped, she opened the door and noticed she had accidentally microwaved her spoon too! She was surprised that the microwave didn’t catch on fire or something. It was just fine. The toaster however, did blow up the next time she tried to make toast. ‘How strange,’ she thought. The girl didn’t think anything else of the spoon incident after that. Everything else appeared to be fine. But then she noticed the mice that lived under the kitchen cabinet were acting a little funny. Some of them ran straight into the wall and died. But others seemed to be glowing in bright neon colors. The girl was confused! She didn’t know what to do. She was supposed to have her friends over that night for a wild party. She couldn’t let them see that she had glowing mice running around everywhere! They would think she was weird and gross and wouldn’t like her anymore. There was no time for her to do anything about it. Her friends would be there any minute! Once they all got there she didn’t see any sign of the glowing mice. But then a little later they started coming out. She hoped no one would see them. Being glowing mice, they were kinda hard to miss and soon noticed by everyone. The girl was so embarrassed! But her friends thought they were great! 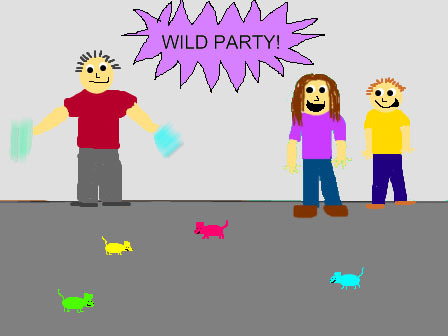 They decided to catch them and have a rave using the glowing mice as glow sticks. So the girl was cool and everyone liked her and her glowing rodents. This entry was posted on Sunday, January 13th, 2008 at 12:00 pm	and is filed under Stories. You can follow any comments to this entry through the RSS 2.0 feed. You can leave a comment, or trackback from your own site. 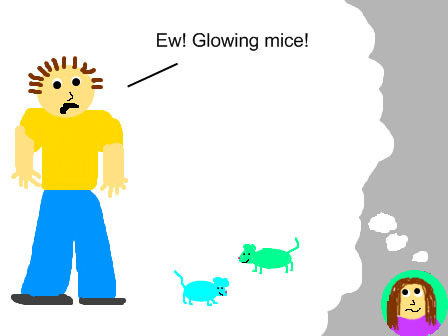 Glowing rodents! Heehee! 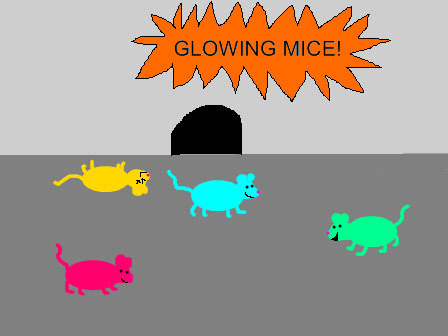 I want to have a rave with glowing mice! Twould be fun! Sorry about your toaster! The new one is better anyway! cool 😀 When are you going to have a rodent rave!? Hahaha our toaster broke too!